I'm ashamed to admit that I haven't been doing too much cooking lately. Sure, I made a half dozen different side dishes for Thanksgiving, but besides that, I've slipped back into my microvave gourmet way of life. For now, I can blame my lack of cooking on my busted kitchen sink. (thanks for breaking right before Thanksgiving, kitchen sink!) But once that situation gets taken care of (Hopefully this weekend? I don't know how people in other countries live without running water in multiple rooms of their house. We're so lucky here. ), I hope to get back on the cooking and baking wagon. Until then, I can read about the cooking of others. Or count down the days until Bistro 185's 3 course prix fixe vegan dinner, being held on December 15, 2010. Last month I had the opportunity to attend a 5 course vegan wine dinner at Bistro 185 with my mother. I typically just get take out for Bistro 185's monthly vegan dinners, but the nice ambiance of the restaurant really added to the experience. I honestly couldn't have been more impressed with Chef Jakub Mejstrik's cooking. Every course was better than the next and the wine pairings were amazing. (maybe too amazing! I'm not used to having that much wine in one sitting!) The upcoming event is a 3 course event, featuring an app (butternut squash soup), an entree (eggplant parm with vegan cheese), and a dessert (apple pie with vegan ice cream). Just thinking about those courses makes my stomach grumble! To reserve your spot for this upcoming event, contact the restaurant directly. You'll need to provided them with a credit card number and your email address. To learn more or to RSVP, visit the event's page on Facebook or become a fan of Bistro 185 on Facebook to get updates on their monthly vegan dinners. Thank you Roxetta. 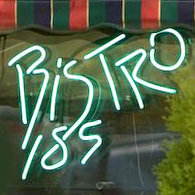 I am glad that you have enjoyed the vegan dinner nights at Bistro 185. Jakub and I have fun cooking together for these events.